A one-time sprinter, Cooper put his running skills to use well on Sunday when he turned in a time of 4.86 in the 40, the fastest of any defensive lineman at the combine who projects as primarily a tackle. INDIANAPOLIS — Xavier Cooper insists he didn’t race to make his decision to leave Washington State a year early and enter the NFL draft. After WSU’s season ended, the 6-foot-4, 299-pound defensive lineman said he stewed over what to do for a month before finally declaring, doing so by issuing a letter posted on the school’s website. Now that he’s headed to the NFL, though, speed is enhancing his draft status. That performance, as well as some solid showings in the three-cone drill and shuttle, had many analysts listing Cooper as one of the winners of the day as linemen and linebackers went through drills. 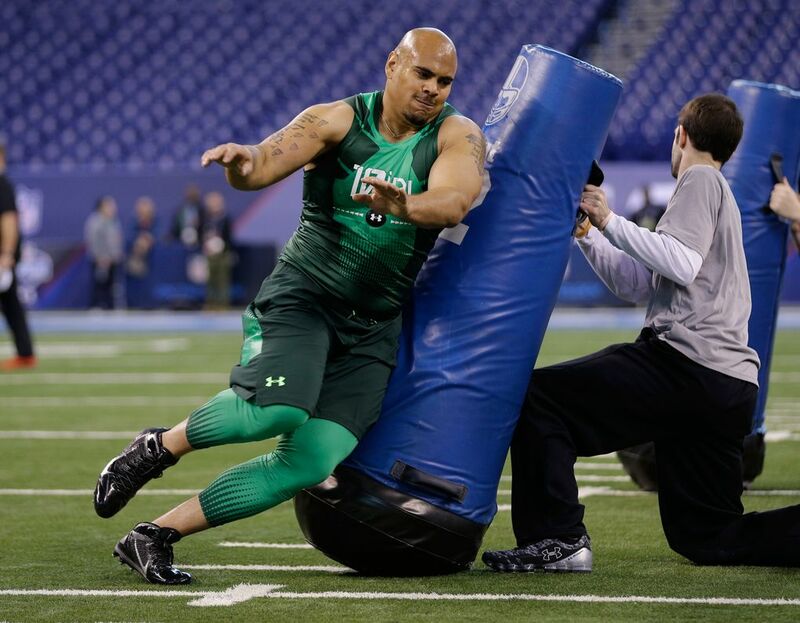 Fewer players looked happier to be at the combine than Cooper, whose path admittedly once seemed uncertain when he received a diagnosis of having a learning disability while in the ninth grade. He has admitted he initially handled it poorly and let his academics slide. A few years later, when he became a star at Wilson, his grades led to limited options. Then-WSU assistant Mike Levenseller devised a plan for Wilson that included attending Tacoma Community College for a fall before coming to WSU to get the needed credits. He says he’s now just eight credits away from a degree in criminal justice with a goal of someday earning a master’s and becoming a principal. Preferably, he says, in Tacoma. “I want to help a lot of the inner city kids down there,’’ he said. For now, that’ll wait while Cooper pursues ever-brightening NFL dreams. He was already considered by some as possibly sneaking into the second round, with the combine performance doing nothing to dim his hopes.